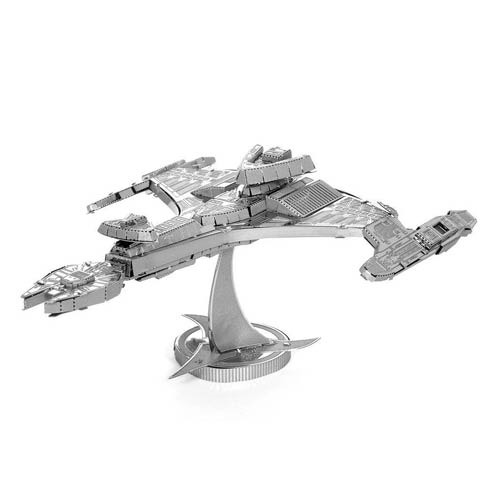 Assemble your own Klingon Vor'cha Class Vehicle from Star Trek: The Next Generation with ease with this Star Trek: The Next Generation Klingon Vor'cha Class Vehicle Metal Earth Model Kit from Fascinations! These amazingly detailed DIY models start as 4-inch square steel sheets and finish as amazing 3-D models. Use the easy-to-follow instructions included with the sheet to pop out the pieces, bend the tabs, and connect them at the attachment points! Build your own Vor'cha Class Vehicle from Star Trek: The Next Generation with this awesome kit! Ages 14 and up.